Martin Griffiths, Special Envoy of the Secretary-General for Yemen, briefs the Security Council on the situation in the country. 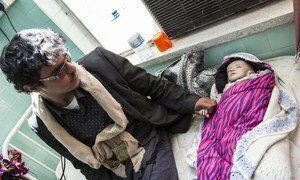 “What I have seen in Yemen this week is the stuff of nightmares, of horror, of deprivation, of misery. And we - all of humanity - have only ourselves to blame.” David Beasley, WFP Executive Director. Restarting Yemen’s collapsed economy was identified by Mr. Griffiths as a main priority, and a “moral responsibility and obligation of the parties to the Yemeni people” He announced that he would soon convene a meeting of the Central Bank of Yemen, facilitated by the International Monetary Fund (IMF).